Sparks is an ongoing Star Wars roleplaying campaign based on the West End Games D6 system and sponsored by Game Base 7. It is run at many conventions across America, and for the first time outside in USA through conventions here in Melbourne. The campaign is set 10 years before the events of Star Wars: A New Hope (Episode IV). All characters are associated with the Crucible Sector Rebellion Cell (some loosely and others who opt to join the ranks of the Rebellion). Pre-gen characters will be provided at the table (for first time players) or bring your own from the tables earlier in the convention! Some mature content, but families can be accommodated at tables. 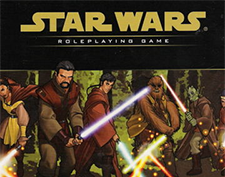 Using a d20 rule base, Living Force was a module campaign set just prior to the Clone Wars. The Cularin system hosts criminal cartels, senators and diplomats, hard working spacefarers, unique local inhabitants and even a Jedi academy! Join adventurers from all corners of the galaxy in exploring the system and its surrounds and protecting its inhabitants from the dark forces that threaten it. 7th Sea is a game of action and high adventure in a world of musketeers, pirates, secret societies and political intrigue. Players take the roles of heroes bent o­n thwarting the plots of knaves and villains, exploring ancient ruins and plundering the treasure fleets of tyrants. The Heroes of Altamira is a Living Campaign using the 7th Sea RPG (first edition), consisting of 16 swashbuckling adventures set around the town of Altamira. Pregenerated characters available at the table. Some mature content, but families are welcome. In this adventure, a kidnapping in the dark of the night leads to a masked man and an implacable enemy without mercy. And if they aren’t careful, the heroes could be next on the chopping block.